Carville have been turning and polishing acrylic pen and fine writing components for almost thirty years. We have been supplying components and kits for fountain pens, roller balls and ball pens to some of the leading global brands such as Parker, Montegrappa, Waterman, Delta, Classic Pens and Onoto. As well as producing acrylic components, Carville also provide services such as etching, fabrication, polishing, brass and other metal manufacturing, and complete pen assembly. The need for precision machining, unique fine threads and high quality finishing is a perfect match for Carville’s capabilities. Due to its lightweight, balance, warm feel and attractive cosmetic appearance, acrylic is a very popular material in the production of component bodies for the fine writing instrument market. The range of standard colours, patterns and finishes from acrylic suppliers is vast, on top of which we can get any colour you could dream of, colour matched exactly, to produce unique fine writing instrument components. 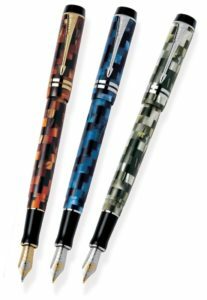 The fine writing instrument market is always looking for something new and unique and Carville have been able to fulfil this by using our proprietary, diffusion bonding and casting techniques for the material stock. With these techniques, we can produce beautiful and exclusive mixes and patterns, including pin stripes, checks, tartan, feathering, mosaic, marbled and many other aesthetic looks not yet conceived. We can also create transparent sections to show off internal components or ink levels. As the different material colours are diffusion bonded together, they form a solid part which is long lasting and hard wearing, compared to just external paints and patterns which can be damaged over time. 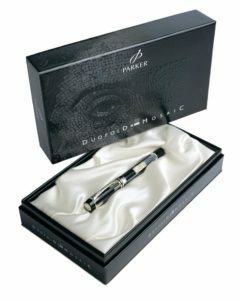 We work closely with the pen manufacturers design and marketing teams to create bespoke and iconic instruments such as the Parker Duofold range. Limited edition celebration pens specific to institutions such as universities, museums, organisations or luxury brands can be created and produced. The added advantages are that due to the nature of this proprietary diffusion bonding, they cannot be copied. If you want to discuss your ideas for a unique writing instrument design, please contact Carville and we will help you explore the possibilities and give you an idea on production runs, timing and costs. We work with clients in Europe, Asia and the USA.